India and dal are synonymous to each other. One can't be in India if they haven't had some version of dal, whichever part of the country they may be in. It's not like we talk lengths about it or how it should be made. For most cooks can blindly make dal, a little bit of this and that lentil, a few spices from the masala dabba (a spice box used by Indians to keep day to day spices), a trusty pressure cooker and a pot full of dal is always simmering away. As much as dal is a necessity, so are the condiments served with it. Achar (pickle, usually lemon or mango), kachumbar (an onion salad) and if it wasn't enough some papadam (wafer-thin lentil crisps) to crunch on are always stationed close to a bowl of dal. While roti is fine, fragrant white grain rice is the lustrous companion one craves. Slurping through the dal coated rice is truly what composes comfort food for most Indians. In my family, it is a twice a week affair, but many vegetarians will tell you that they have some form of dal everyday along side a vegetable preparation. It was not until we travelled to Turkey four years back that I fully embraced it as a soup, to be sipped with a deep spoon, without any condiments, piping hot with a crusty sourdough bread instead of a roti. 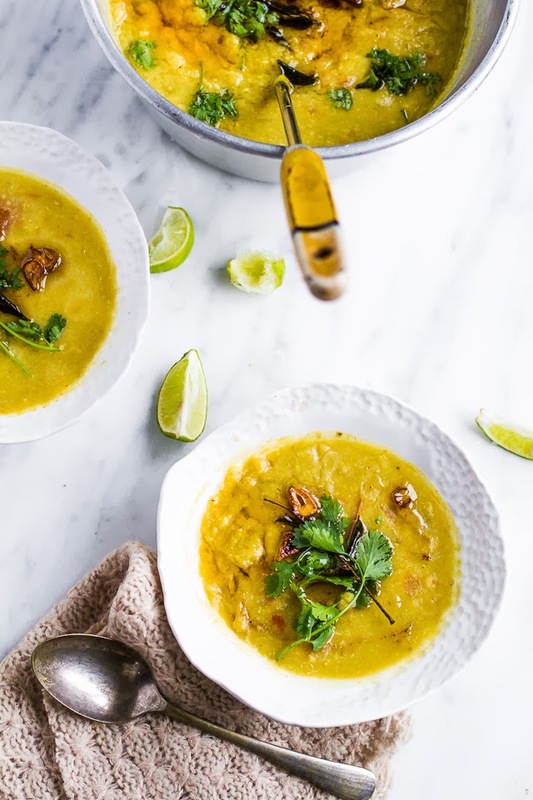 What makes Indian dal stand out from an otherwise bland puree of lentils is the tadka, a technique of adding spices and flavour to the hot oil that's mixed into the puree to give a distinct flavour. This is my everyday dal, one I make without any measurement or thought. Everyone's everyday dal will be slightly different. A different lentil mix, a different tadka, a different thickness but in my observation, their favourite will always be the one they grew up with. For instance, the one I grew up with never had red chillies or red chilly powder, the heat would only come from fresh green chillies, with tons of cilantro forming a pale green hue in an otherwise mustard coloured soup. Dal usually refers to the pulses or lentils that are split so in essence soupy dal is made with split variety. When whole lentils are used, the preparation is usually on the drier side, more like a curry. This of course is just a general outline. Whole red chillies can be added to the tempering for a spicier version. Also, mustard seeds, onions, cherry tomatoes etc can be added in the tempering. Whether enjoyed as soup or a meal with some carbs, the only condiment that shouldn't be missed is several wedges of lemon. Pressure cook all the ingredients (except for tempering) for 15 minutes until the lentils are completely cooked and mashes. Alternatively cook them in a heavy bottom sauce pan which might take about 30-40 minutes. Whisk the mash and add more or less water depending on the consistency required. Heat ghee in a small saucepan and add curry leaves, once they crisp add cumin seeds, ginger paste and sliced garlic. Once the garlic brown add the oil to the dal mixture. Add chopped coriander leaves and lemon juice. Serve hot. A beautiful soup! Wholesome and flavorful. .... love Dal, you know that! This one looks almost exactly like the one in my favourite Indian place. They have black beans in it, I don't know what it is and I probably won't find it here. Even finding red lentils is a big task, and then I'm not even starting on the curry leaves. I really need to visit the spice shop in London! I am definitely going to cook this! Yum! Let me know how it goes Torie! I adore dal, but have never tried a dal soup. This looks truly divine Kulsum. And I love the gorgeous lighting in your images. Thank you Jennifer. Yes, it is amazing as a soup and served like that in most Indian restaurants these days. Absolutely lovely and sounds fantastic. The funny thing is I was just looking at my lentils only 10 minutes ago wondering what to make with them today. Thank you! and your photos are mouth watering! Such a sweet comment Shweta! Thank you so much. there is ghee in the tempering :) but yes an extra dollop of pure desi ghee is blissful. daal is always so comforting!! and i love those bowls. 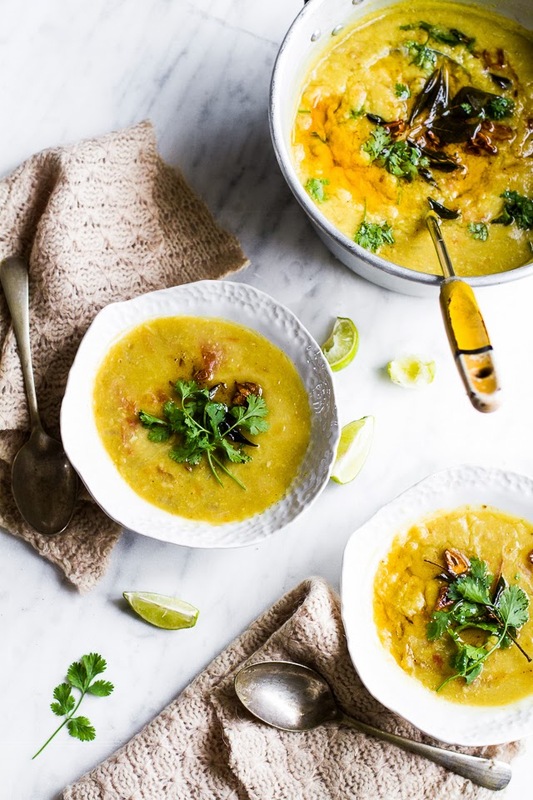 This dal sounds so good! Super comforting and homey and hearty and spicy all at once. :) I love it! So amazing! 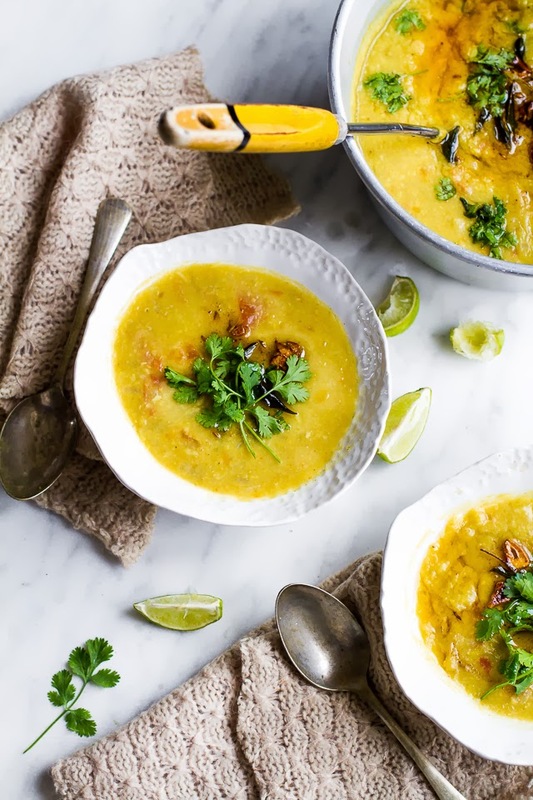 Tadka Dal is one of our favourites and made almost every other day, not with that extra papmering of Desi Ghee of course! Yasmin-I'm so happy to know specially because your younger one liked it! Thanks for the feedback. 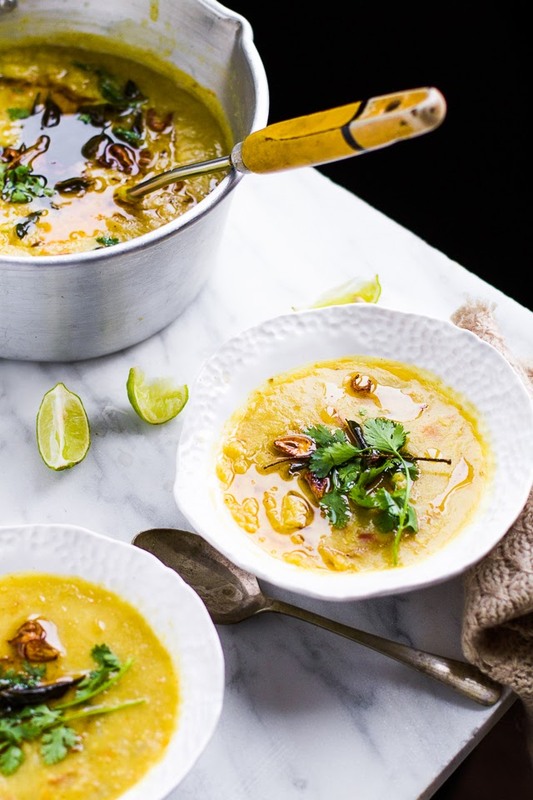 What a beautifully vibrant soup and I love those pretty bowls you've served them in! I am new to trying out new recipes so please tell me what is garlic paste and ginger paste and what is ghee. The recipe looks good. On the stove right now, and the house smells wonderful. Made this recipe exactly and it is wonderful. I'm glad I went the extra mile to go my local Indian grocery to find curry leaves. I've never cooked with them before and I feel it's what makes this dal taste so good. Thanks so much for this recipe!